The melancholy that hits us Bengalis on Bijoya Dashami, the last day of the Durga Pujas, would make Orhan Pamuk seem like Mary Poppins on steroids. During my growing up years, the Durga Pujo was the one festival that we would look forward to all year long. We had (and still have) a puja in our apartment complex in Calcutta. It would be 5 days of fun and festivities, of no studies, of hanging around with friends, helping the grown ups with the organisation of the puja, taking part in the cultural festival and skits and songs, the odd building romance as we grew up, and of course serving food in the afternoon for the community lunch. On Doshomi you knew that the fun was coming to an end and you tried to make the most of the day. 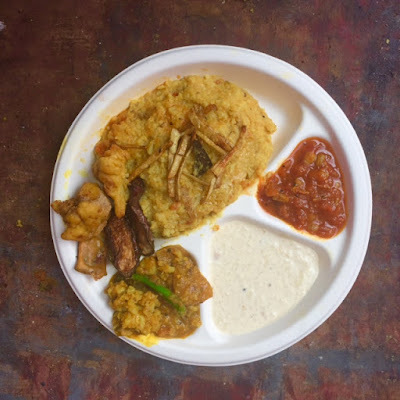 The high point of doshomi in Kolkata was that the community lunch included mutton. Bishorjon (visarjan) would happen in the evening and we would come home deflated but bravely shouting "aashcche bochhor abar hobe" (she'll be back next year). I've moved out of Kolkata years back and Mumbai has been home for more than a decade and a half and I am happy that I have found my parar pujo here too. The Bandra Notun Palli Pujo. 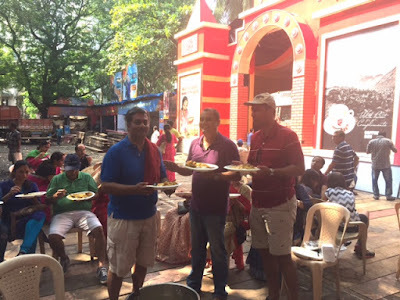 I dropped in at the Bandra Pujo at lunch time today. The ladies were done with their shidoor khela and boron and it was time to eat before folks took off for the bishorjon. The workers who would help lift the Goddess, local Maharashtrians I think going by their topis, were being fed first. They had a weighty duty on hand after all. I saw that the bhog (community lunch) distribution had started and I decided to jump in and asked if any of the volunteers needed replacements. I was put on fulkopir torkari (cauliflower curry) serving duty. Suddenly Ani, a collegian who earlier greeted me by calling me 'Kolyan Kaku' (uncle) and got scolded by me, asked if there was anyone willing to take on the khichuri duty. A new balti of khicuri had come and it was hot and steaming. 'Not for amateurs', he said. I raised my hands and young Ani (Subhojit) gave me a khunti (ladle). Then, in all seriousness, he showed me how to balance an empty plate on the edge of the balti, and use the support of the rim of the vessel, before pouring out the khichuri onto the plate for serving those in the queue. He has got a wise head on his young shoulder but then he has grown up with this pujo after all. I was so happy to be not only serving, but to be given the most important duty, that of serving khichuri, too. That's usually given to veterans. You can check this Facebook Live video that Souptikk shot, while I served, to see how happy I was. Bhog poribeshon (serving) over, I sat with those in the organising committee and we had our lunch. Kaushik in the blue tee shirt. Kaushik Saha, the food committee captain for the last 30 years, and who has grown up with pujo over 40 years, gave us some special alu bhaja and beguni to reward us for our efforts. The Notun Palli team then left for the bishorjon but I headed home as this khichuri deserved a ghoom (afternoon nap). I went up to our apartment and rang the bell. My hands were full as I was carrying back a plate of khichuri for my mother, just as I used to in my growing up days in Kolkata. I was beaming with joy. It finally felt like my pujo was complete. Shubho Bijoya folks and wish you all loads of happiness. PS: You can come back to the Patwardhan Park Annexe Behind Theobroma on 15th October 2016. Lokkhi Pujo will be there in the evening and bhog will be served at 8.30 pm. Shubho Bijoya to you and your loved ones!!! Subho Bijoya Kalyan. I have been been to this pujo when I stayed in Bandra. I still remember someone shouted, "Gobindo, bhog ta niye esho"!